The Magi took unusual effort to pursue the Savior of the world based on their astrological knowledge. While seeking the King of the Jews, they also announced the birth of the Emmanuel to the king, priests, and teachers of the Jews in Jerusalem. However, the King Herod’s reaction was to kill the child while the priests and scribes ignored the message. They all missed the great treasure that the wise men from the east have found. They presented gifts to the King of the Jews and Jesus in return blessed them with faith and salvation. The wise men have been honored and venerated as saints. Jesus and his message of salvation is the treasure for which we need to give up everything else (Mathew 13:44-46) like the Magi. (1) When Jesus was born in Bethlehem of Judea, in the days of King Herod, behold, magi from the east arrived in Jerusalem, (2) saying, “Where is the newborn king of the Jews? We saw his star at its rising and have come to do him homage.” (3) When King Herod heard this, he was greatly troubled, and all Jerusalem with him. (4) Assembling all the chief priests and the scribes of the people, he inquired of them where the Messiah was to be born. (5) They said to him, “In Bethlehem of Judea, for thus it has been written through the prophet: (6) ‘And you, Bethlehem, land of Judah, are by no means least among the rulers of Judah; since from you shall come a ruler, who is to shepherd my people Israel.’” (7) Then Herod called the magi secretly and ascertained from them the time of the star’s appearance. (8) He sent them to Bethlehem and said, “Go and search diligently for the child. When you have found him, bring me word, that I too may go and do him homage.” (9) After their audience with the king they set out. And behold, the star that they had seen at its rising preceded them, until it came and stopped over the place where the child was. (10) They were overjoyed at seeing the star,(11) and on entering the house they saw the child with Mary his mother. They prostrated themselves and did him homage. Then they opened their treasures and offered him gifts of gold, frankincense, and myrrh. (12) And having been warned in a dream not to return to Herod, they departed for their country by another way. The central theme of the visit of the Magi is the rejection of Jesus by the Jews and acceptance of him by the gentiles. The Evangelist Mathew specifies the birthplace of Jesus as “Bethlehem of Judea” to distinguish it from another Bethlehem near the Sea of Galilee that was part of the tribe of Zebulun. (Joshua 19:15). Bethlehem was six miles south of Jerusalem and was formerly known as Ephrath. Bethlehem means “the house of bread” because it was a fertile land for farming and rearing animals. Some Old Testament events had happened in Bethlehem. Jacob’s favorite wife Rachel died on the road to Ephrath (Bethlehem) and she was buried near Ephrath where Jacob erected a pillar to mark her grave. (Genesis 35:19-20, 48:7). Ruth had lived and married Boaz here. (Ruth 1:22). Above all, Bethlehem was the home and city of David. (1Samuel 16:1, 17:12, 20:6). God had promised to David that the Messiah would come from his line (1 Chronicles 17: 11-14) and prophet Micah had specified that the Messiah will come from Bethlehem. (Micah 5:2). Herod, the king of the Jews, was half Jew and half Idumaean. Roman Senate with the recommendation of Antony, first appointed him governor in 47 BC and in 40 BC gave him the title of king. He ruled Jews for a long period until his death in 4 B.C. He was also known as King Herod the Great because he was an able ruler, brought peace and order in the midst of chaos, constructed prominent structures including the famous Temple of Jerusalem. He was generous to his people when they had economic difficulty or starvation. King Herod was stationed at Jerusalem when the Magi arrived from the East though he had other residences. Magi were Medes from the Median tribe that was part of the Persian empire. They had attempted to overthrow the Persians and establish the rule of Medes. When that failed, they became a tribe of priests like Levites of Israel. They also served as teachers and advisors of Persian Kings. Hence they were men of holiness and wisdom. Magi were experts in all branches of knowledge at their time. They were also astrologers, fortunetellers and interpreters of dreams. Bible does not specify how many wise men came. One tradition was that they were 12. The universal acceptance of three is associated with the three gifts they gave to Infant Jesus. The legends gave them names: Melchior, Gaspar and Balthasar. Though Mathew does not specify the Magi as kings, some texts in the Old Testament predicting the arrival of kings with the same gifts that Magi brought led to the interpretation that they were kings. (Psalm 72:10, 15; Isiah 60:6). Another interpretation came from Palms 72:11. 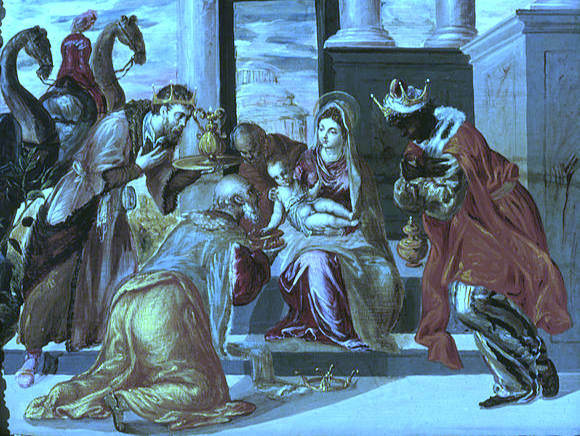 “May all kings bow before him, all nations serve him.” “According to Western church tradition, Balthasar is often represented as a king of Arabia or sometimes Ethiopia, Melchior as a king of Persia, and Gaspar as a king of India.” (https://www.britannica.com/topic/Magi). East of Jerusalem can mean Arabia, Persia or Mesopotamia. The traditional concept is that Magi came from Persia. The Magi came to Jerusalem, the capital city of Jews, because their assumption was that the king of the Jews might be born in that royal city. The star that guided them withdrew for a while so that they should inform the ruling king of Jews, the high priest of the time, and teachers of the law know about the birth of the Messiah. The Jewish leaders failed to understand the birth of their king. They had to know it from the gentile astronomers. The Jewish leaders helped the Magi to find out that the king would be born in Bethlehem. Still the Jewish experts failed to search for their own king born in Bethlehem. From the question of Magi, “Where is the newborn king of the Jews?” it is implied that the Magi were not Jews. People in the East had a belief that a sovereign king of the world would arise from Judea. The Jews were also expecting the Messiah at that time. So, both Jews and gentiles were awaiting the arrival of the promised king when Jesus was born. Star can be any luminous meteor out on the sky. Modern astronomers calculate that it was Jupiter and so not a star in the strict modern concept. There was an ancient belief that a new star would appear at the birth of a ruler. (3) When King Herod heard this, he was greatly troubled, and all Jerusalem with him. King Herod got his authority over the Jews from the Roman emperor. Jews could not accept Herod as their king because he was of a mixed race and not a genealogical descendant of King David. Jews, based on the Holy Scripture, believed that their king should always be from the line of King David. So, Herod was aware of the rejective mentality of Jews toward him and he was always careful to protect his kingship. He had even killed his wife Maraimne, her mother Alexandra, his son Antipater, Alexander and Aristobulus. Such an insanely king would try to eliminate an infant to be born as king to replace him. The whole Jerusalem was also troubled because the Jews in Jerusalem knew that the power- hungry Herod would get rid of any king that would be born to save them. (4) Assembling all the chief priests and the scribes of the people, he inquired of them where the Messiah was to be born. The head of the Aaronic family was supposed to be the high priest. However, Romans had removed him to appoint their own favorite person in that prestigious position. High priests include the then high priest along with those who held the same office before. Scribes were originally transcribers of the law and readers in the synagogue. Later they became also interpreters of religious and civil laws. Some Bible scholars assume that Herod summoned the Sanhedrin, the supreme council of 72 representatives, considering the importance of the matter. Herod knew that there were prophesies on the birth of the Messiah. So the High Priests and Scribes would be able to tell him the place of birth of this divine savior. The scriptural experts had no doubt about the birthplace of the Messiah. The high priests and scribes quoted from the prophet Micah 5:2. (7) Then Herod called the magi secretly and ascertained from them the time of the star’s appearance. Herod’s design to destroy God’s plan of salvation was done in private because he did not trust anyone including the Jewish leaders he consulted. Herod did not follow the Magi or send his soldiers along with them for fear that the Jews would accept and defend the newborn King who might soon replace him. Herod was smart to hide his anxiety on the birth announcement of his enemy king. And he was diligent to find out the time of the star’s appearance to determine the time of birth of the newborn king. Based on that he had ordered to kill children age two or below. Herod trusted the Magi. In fact, Magi believed Herod and were willing to return to him. They could only appreciate his good will to help them and his “humbleness” to accept the new born king and pay him homage. (9) After their audience with the king they set out. And behold, the star that they had seen at its rising preceded them, until it came and stopped over the place where the child was. There was disappearance of the star that made the Magi to search for the new born king in the palace of King Herod. However, God brought the star back to guide them to Bethlehem. The Magi could not get any help from King Herod, except that he could tell with the help of the scriptural scholars that the child must be born in Bethlehem. It was the star, that God sent, guided them to Infant Jesus. (11) And on entering the house they saw the child with Mary his mother. They prostrated themselves and did him homage. Then they opened their treasures and offered him gifts of gold, frankincense, and myrrh. According to the scholars, by the time the Magi arrived, Jesus might have grown few months and the Holy Family might have found a better place to live in Bethlehem. That is why Mathew writes that the Magi entered not a stable but a house. Child Jesus is mentioned first because that was their purpose of the long and tedious journey from the far East. Joseph must be present. However, Mathew mentions only Mary, the mother of the infant. The Magi saw divinity in the child. That is why they fell and worshipped the Infant Jesus. They came not to see a regular king of Jews. They were sure that the expected savior of the world was born. That was why they traveled a long distance to see this unknown child without any invitation from a palace or a royal family. Offered him gifts of gold, frankincense, and myrrh. The Magi were considered as people of different ages. Melchior was old man with gray hair and long beard who carried gold acknowledging the kingship of the child. Gaspar (Caspar) was young and beardless who brought frankincense honoring Jesus as God. Balthasar was middle aged, dark-complexioned with new black beard carrying myrrh signifying that the Messiah had to die. The offerings were religious items to God representing the three-fold function of Jesus. Frankincense was an aromatic used in sacrificial offering because animal sacrifices were stinky. It stood for Jesus the new High Priest and the Lamb of God who voluntarily sacrificed his life replacing all the previous animal sacrifices. Myrrh was used in perfuming ointments to anoint the representatives of God like prophet, priest, or king. So it represented the prophetic role of Jesus. Myrrh was also used for embalming the dead bodies. Thus, it signified the death and burial of Jesus. The gold, the king of metals, was representative of the Kingship of Jesus though his kingship was different from worldly kings. The offering of the gold was beneficial to the Holy family when they had to stay long in Bethlehem and then flee to Egypt to protect Jesus. (12) And having been warned in a dream not to return to Herod, they departed for their country by another way. The Magi also believed in dream and avoided their return to King Herod. So they had to depart hiding from King Herod and his officers. A 14th century cleric John of Hildesheim in his writing Historia Trium Regum, the History of the Three Kings, gives the story of what happened to the Magi as follows: The three wise men, Melchior, Balthazar, and Gaspar, were kings of "Ind, Chaldea, and Persia." They traveled non-stop from their own lands "in great haste." When they departed Bethlehem after worshipping the Infant Jesus, they continued together until they reached the Hill of Vaws, or Hill of Victory, on the border of Ind, where a watchtower was maintained. It was here that the Star was first seen. Before departing to their own countries, the three kings agreed to meet at the same place once a year, and they decided that they should be buried at the Hill of Vaws. Years later, a star appeared above the cities in which the kings lived just before Christmas, signifying to them that they were near death. They gathered at the Hill of Vaws and built a large tomb for them. When they died, the sorrowing people buried them in the same tomb. St. Queen Helena, the mother of Roman Emperor Constantine, collected the bodies of the three kings and brought them into the church of Saint Sophia in Constantinople in the forth century. At a later period, because of persecution of Christians, Emperor Mauricius moved the relics to a church in Milan. In the 12th century, Roman Emperor Frederick I rewarded the relics to Archbishop of Cologne Rainald von Dassel for offering him military aid to win a war in Italy against Milan. The relics was moved to Cologne in 1164. (https://archive.archaeology.org/online/reviews/threekings). The relics are now kept above and behind the high altar of the Catholic Cathedral in Cologne. The Magi are honored and venerated as saints. The tradition of exchanging gifts during Christmas season has its origin from the three kings who gave gifts to Jesus. 1. Sacrificial search of the Magi: These wise men were like treasure hunters. Their treasure was not a regular king but a divine king who would be their savior also. If they believed that he was a regular king of Jews, they would not have taken so much risk to travel during a cold winter season following a star that became their navigator. The star could guide them only at night. And even at night it was not visible all the time. That was why they were seeking the help of King Herod. While the pagans were searching for God, the so-called true followers were ignoring him. Like the Magi, let us risk ourselves and search Jesus who said, “I am the way, the truth, and the life.” (John 14:6). 2. Corrupt Jewish Leaders: When Romans ruled the Jews, they overthrew the traditional successors of Aaron and David from priesthood and kingship respectively. So King Herod was not even a Jew but a mixed race and high priest and members of the Sanhedrin were supporters of King Herod. They wanted to please Herod rather than seeking God incarnate in Bethlehem. So they took an approach of indifference to the born Messiah and continued involving in the temple rituals. Let us examine how much we are indifferent to Jesus and his church, and how corrupt we are or how much are we attached to the world. 3. Message Ignored: When the Angel of the Lord informed the shepherds in Bethlehem, they responded immediately by searching and worshipping Jesus. King Herod, the High priest, and the whole Sanhedrin were informed of the birth of the long-awaited Messiah through the royal Magi. However, none of them cared and Herod wanted to assassinate the Infant Jesus. 4. Exchange of Christmas gifts: Though St. Nicholas is depicted as Santa Claus for the distribution of gifts to children, the origin of Christmas gift sharing is from the Holy Wise Men who offered gifts to Infant Jesus. Our gift giving during Christmas season becomes pleasing to God only when we give charitable gift to the less fortunate in the society in the place of Jesus. In fact, we give Christmas gift to our friends and relatives but forget to give it to Jesus through the poor.